Our first Farm Fresh Food Days tasting went swimmingly! On our very first day of the tasting, we had some coverage from local news at Cornerstone Elementary. You can see the resulting article and photos HERE. This month, tastings of Cherry Tomatoes and Basil from local farms and our school gardens happened at Cornerstone, Bates, Creekside, and Wylie. 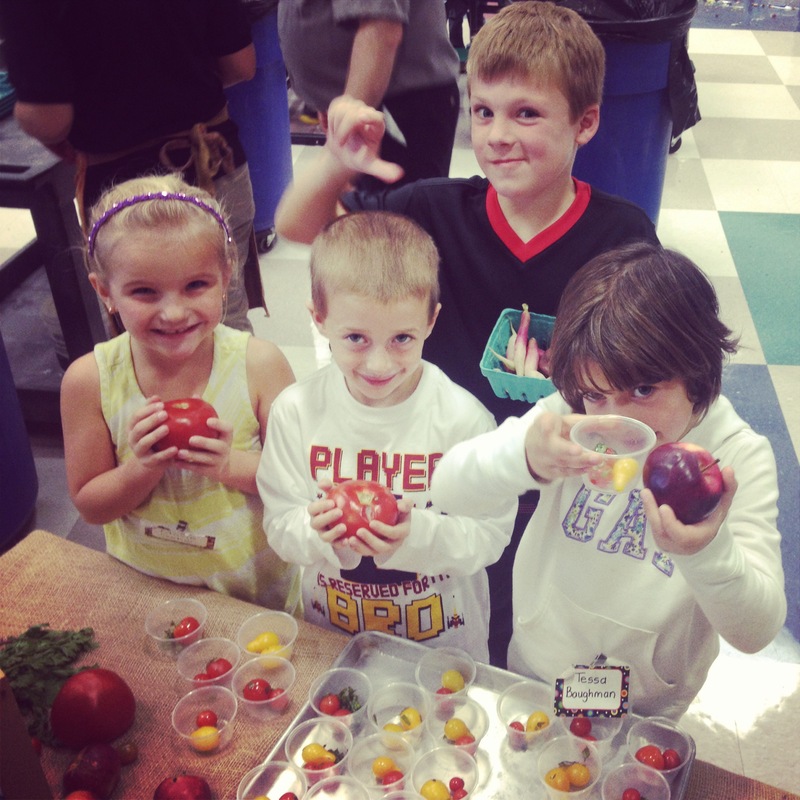 Here’s a brief recap of our first attempt to introduce more Dexter kids to fresh, local foods in the school cafeterias . . .
We went through about 35 pounds of Cherry Tomatoes, and ~1 lb. of basil for the tastings in the 4 Dexter elementary schools. Dexter Food and Nutrition purchased 17 lbs. of tomatoes from Capella Farm, 9 lbs. cherry tomatoes and ~1/4 lb. of basil from Senna Prairie Farm, and received basil and additional tomatoes from the Creekside school garden as a donation. 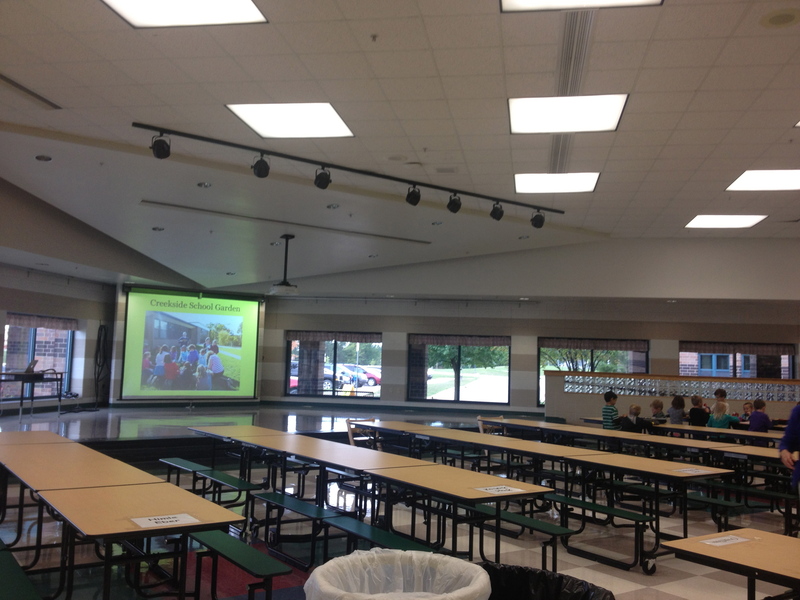 Practically the full range of human emotions was seen in kids’ facial expressions in reaction to the food and table setup in their lunch rooms. Some had jaws dropped to the floor in excitement, others had furrowed brows and squished upper lips is apprehension. Though, even kids with sideways glances tried samples seemingly because of the hoopla surrounding the special event. We hope to generate buzz like this continually. 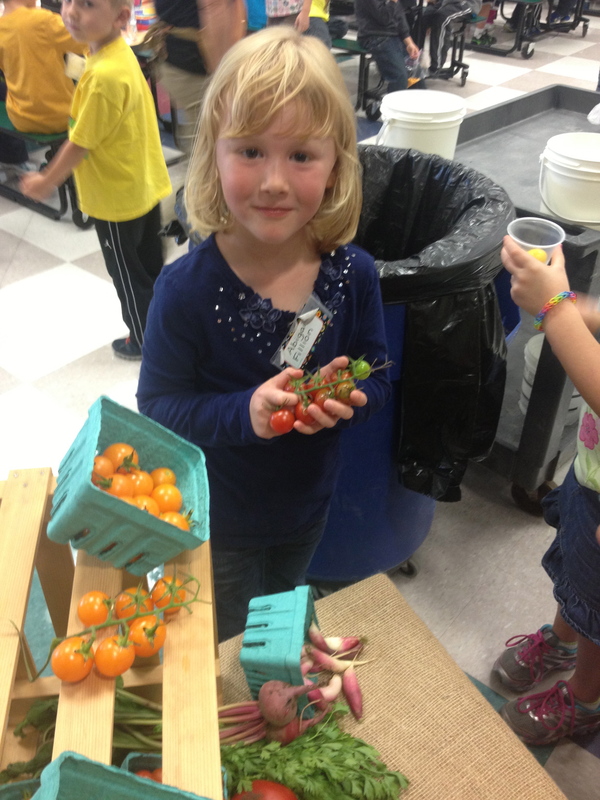 Kids at Cornerstone had mixed reactions to the tomatoes and basil, but many were willing to give them a try. 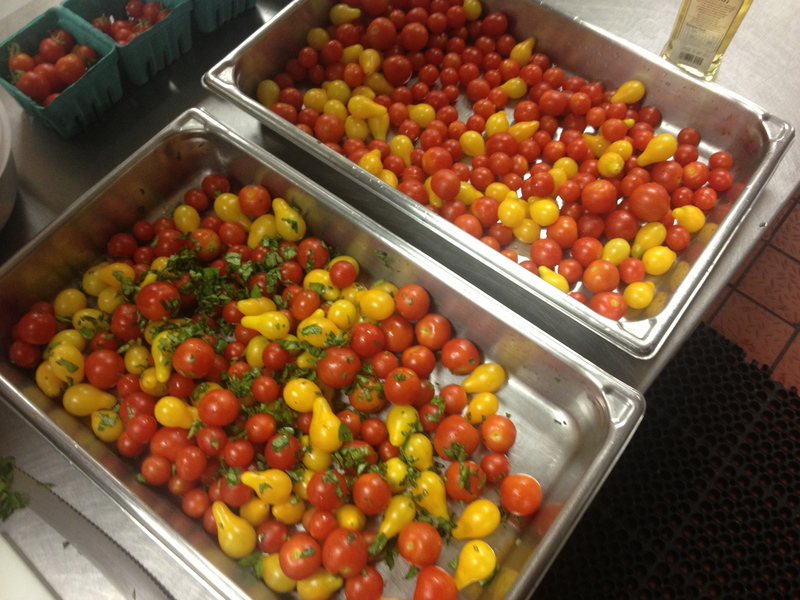 Locally grown cherry tomatoes and basil were prepped at Cornerstone Elementary kitchen with help from Dexter F&N staff. 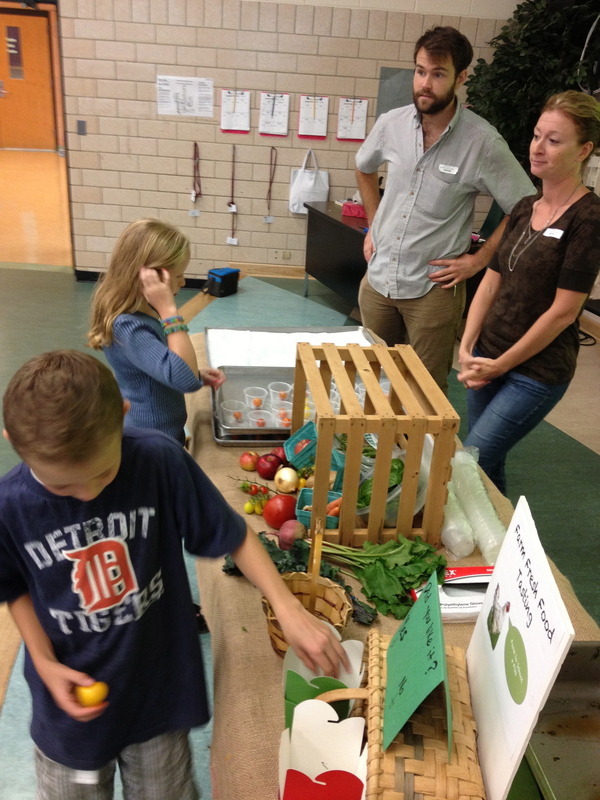 During each tasting, kids grabbed a sample, took a look at other seasonal foods growing in MI right now, and voted “thumbs-up” or “thumbs-down” on what they thought about the samples. Results yielded more UP than DOWN at each school! 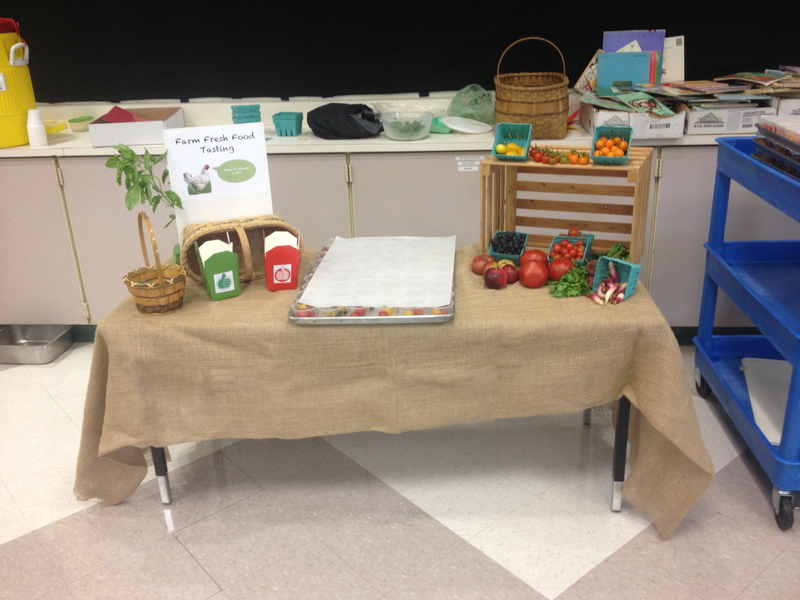 Photos of the farms and farmers that grew the food played during the tastings in each school. Some kids thought it was “a movie” made especially for lunch! Students also had a chance to see tomatoes on the vine and identified which tomatoes were ripe and which ones weren’t ripe yet. Never mind seconds. 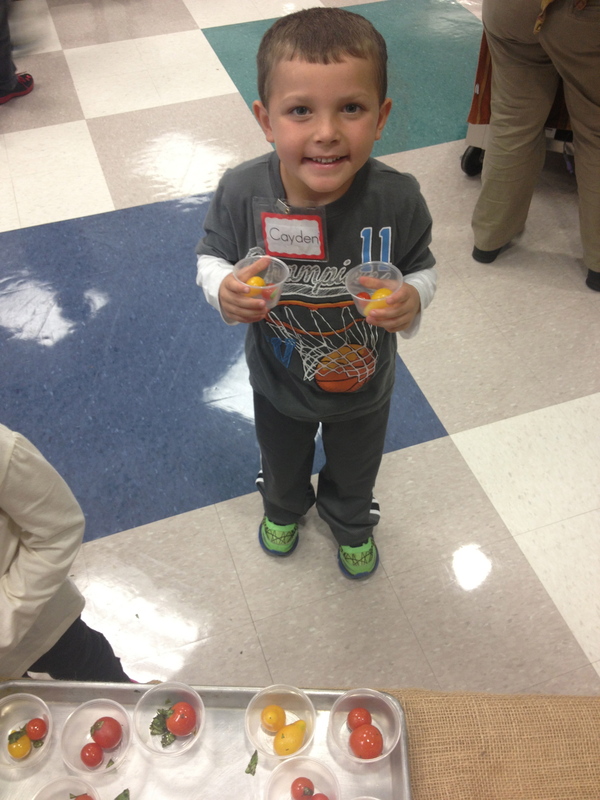 Cayden at Cornerstone came back for “sixths” on these samples! This kids couldn’t get enough! 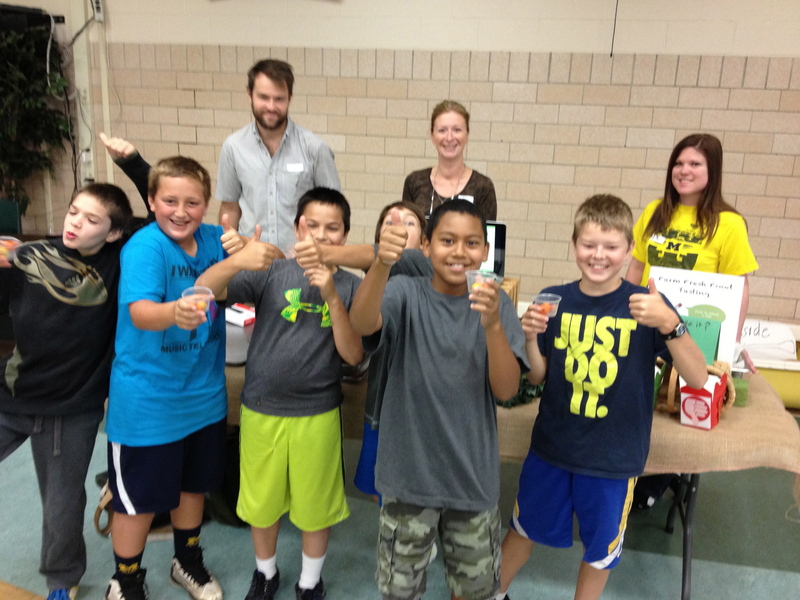 Students at Creekside enjoyed the tasting and weren’t shy about it! 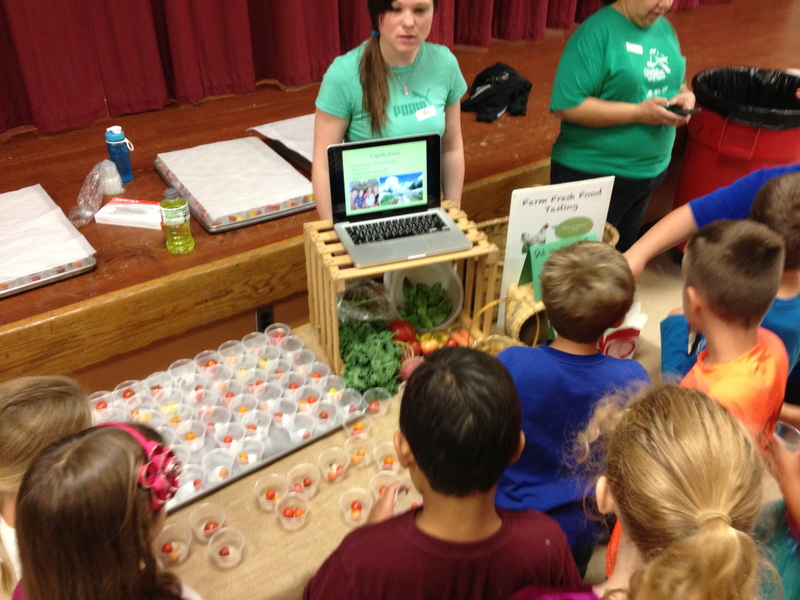 Volunteers James and Kim were excited to talk to students at Creekside about healthy eating. Thanks to our volunteers and school staff for being so supportive! We hope that future tastings continue to support positive change.